Fear of legal action against their medical license, has driven some doctors out of business. This makes it even harder to find pain management care. Some of our doctors have stopped giving prescriptions for pain medications without making other treatments available to us. If you need more information about this situation, I’ve included links below to 4 articles about the effects of the opioid crisis on chronic pain patients. This situation is very discouraging, but there are things we can do to help us get the care we need. 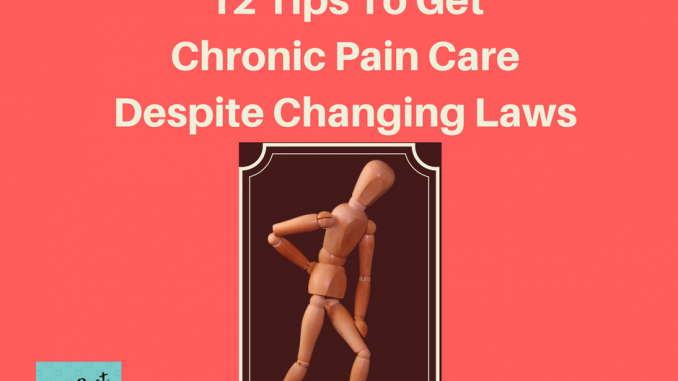 Let your legislators know how the laws are affecting you, and ask them to take chronic pain patients into consideration when crafting new laws or changing existing ones. Take copies of your pain management plan, diagnoses, and medications with you if you have to visit an urgent care center or ER. This information is often found on visit summary sheets given out at the end of doctor appointments. Speak to a nurse manager and/or patient representative if you feel that you’re not being taken seriously while at an urgent care or the ER. Get your pain medication prescriptions from only one doctor and go to the same pharmacy each time. Speak calmly and try not to lose your temper with your doctor or health care providers. They’re required to follow these rules, and didn’t make them. They’re stuck between a rock and a hard place just like you are. Always take someone with you when you have to go to the emergency room. Preferably someone who knows your medical history. If you don’t have a primary care physician, get one ASAP. Call them first, unless you’re having chest pain, severe breathing trouble, stroke symptoms, seizures, or heavy bleeding. Then call 911 or your local emergency number first to be taken to the ER. Call your insurance company to see if case management services are available. They can help you manage your health conditions better. If you’re a caregiver, learn all you can about your loved one’s health conditions, medications, and signs of problems that require doctor care. Communicate clearly with ER staff why your symptoms brought you to the ER. For example, if you’re taking blood thinners and are experiencing bruising/bleeding along with pain, emphasize your concern about internal bleeding. Don’t just ask for pain relief. Create a binder/folder of medical records, and take this with you to new doctor appointments and the ER. If you have found this information helpful, please consider signing up for email updates and freebies. Current freebies include a traveling with chronic illness/pain guide and a medication safety e-book. Thank you, Claire, for reading and sharing. It means so much to me.